Feature Friday - Search All The Things, now on Mobile! RepairShopr's iOS and Android apps now have the same Search power as RepairShopr web! Universal Search, better known as "Search All The Things," is now available on the latest versions of RepairShopr's iOS and Android apps. This means you can quickly access critical information from Customers, Tickets, Invoices, or Products while working on-the-go and in the field. 1) Tap the Search field at the top of the app and enter a word or partial word to locate all references to it within the app. 2) Search results will show any match within a particular Customer, Ticket, Invoice, or Product. 3) Tap the result in the list to view it in detail. 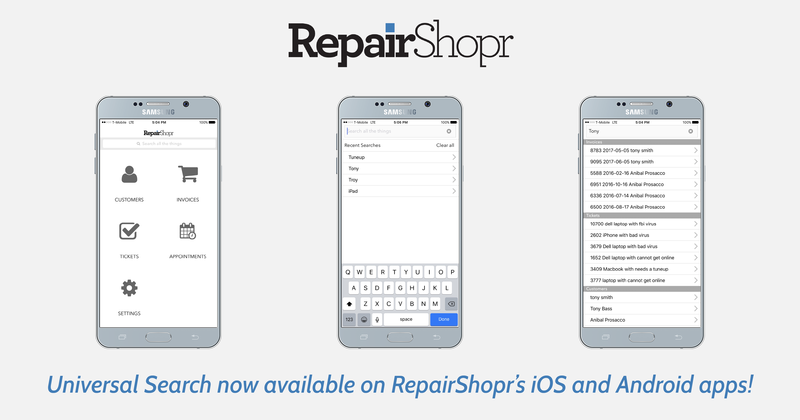 If you've already downloaded RepairShopr's app on your iPhone or Android phone, make sure you've updated to the most recent version in order to use Universal Search. If you haven't tried RepairShopr's apps yet, now's the time! Click here to download RepairShopr for iPhone. Click here to download RepairShopr for Android.